Choose the best time to book flights to Las Vegas to find the best available deal for flights. Take a trip to see the casinos and entertainment venues of this spectacular travel destination and secure the cheapest deal using the Skyscanner search tools. Increase your chances by choosing the right time to confirm your flights. Below is a breakdown of the best time to book for popular routes to Las Vegas. Data predicts that the best time to book flights to Las Vegas is one month before you plan to fly to the destination. Choose the best time to book and you can make 10% savings on the average ticket price. Looking at information from last year can help predict the best days to fly. Travelers looking for the best deal to Las Vegas can set up price alerts with Skyscanner. Las Vegas is on the most exciting travel destination in America. Finding the best time to book allows travelers to save money on their airfare, which gives you a bigger budget for having fun when you arrive in Nevada. An extremely accessible location, you can fly direct to McCarran International Airport from many major cities in the United States. Popular airlines that operate routes to Las Vegas include American Airlines, Delta, JetBlue, Southwest and Virgin America. After you have booked your flight at the best time, look for cheap deals on hotels in Las Vegas. There are key steps you can take to find the best time to book and increase your chances of securing the cheapest prices on air travel. This includes using our new Best Time to Book Flights to Las Vegas tool, Cheapest Month Search feature and setting up Price Alerts. *Skyscanner’s Best Time to Book tool is based on historical booking data from all throughout 2018. While we cannot predict exactly which factors may impact flight prices in 2019, we have analyzed a considerable amount of data to allow us to identify clear flight pricing patterns that we would expect to be replicated this coming year. These results should be considered as a guide for travelers and only as a strong recommendation from Skyscanner, based on advanced data analytics, on how to save the most money booking your next flights. 😊 Rest assured, there will never be perfect date to guarantee when flights will be the cheapest. Use the search tool below to search for flights and set price alerts. 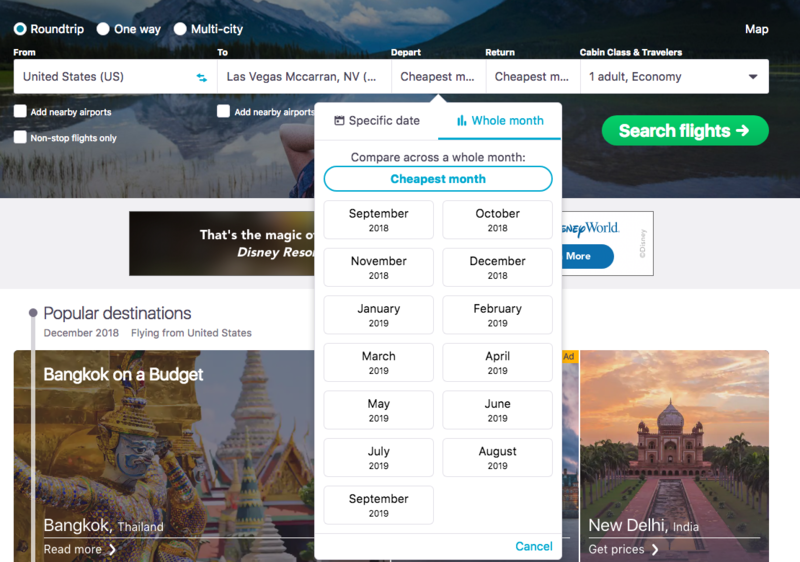 Use Skyscanner’s Cheapest Month feature to find when is the cheapest month to fly to Las Vegas from your departure city. Discover the casinos and attractions of the Las Vegas Strip when you book cheap flights to McCarran International Airport. The cheapest months to fly to Las Vegas are January, February, April, and September. Prices can be higher during March, July, and December. Travelers can find cheap deals from $54 from airports in locations such as Denver, San Francisco, Los Angeles, Oakland and El Paso. Based on historic exit data looking at overall US travelers, travel trends suggest that the best time to book flights to Las Vegas is roughly four weeks before departure. You may be able to find flights that are 10% cheaper than average fares or more. 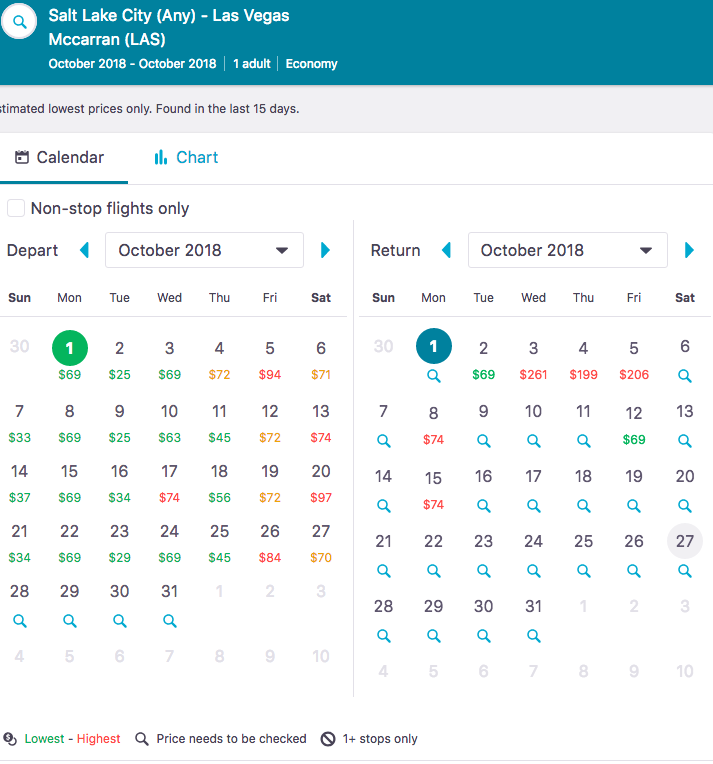 If you use Skyscanner’s flight search function then you will be able to compare flights across different airlines to find the best possible deal. You can also compare flight times and flight connections from your chosen point of origin. On a related note, check out Skyscanner’s analysis on the Best Time to Book Flights for the United States, so that you can guarantee the best flight prices for all your next trips. From New York, to Miami, to London – there is a travel recommendation for all likings. If you search for flights to Las Vegas four weeks before your proposed departure date, comparing flight prices across the month will allow you to see which deal is best for you. Enter your origin airport and McCarran International Airport as your destination. Now, select whole month for your search result and you will see prices available for each day. This allows you to look for savings before you book your flights. If you are flexible about the dates of your travel then there will be more opportunity for you to secure the best travel deal. While looking for flights to Las Vegas four weeks before you depart can lead you to the lowest available prices, there are other ways to ensure that you find the best deal. If you set up a free Skyscanner Price Alert then you will receive an email to let you know when prices change on your chosen route. Use all the tools available to you on Skyscanner.com to make sure you find the best price when you book flights to the bright lights of Las Vegas. Download the App by clicking below. Last-minute flights used to be the go-to for travelers looking for cheap flights. But in the age of budget airlines, are last-minute flight deals impossible to find today?